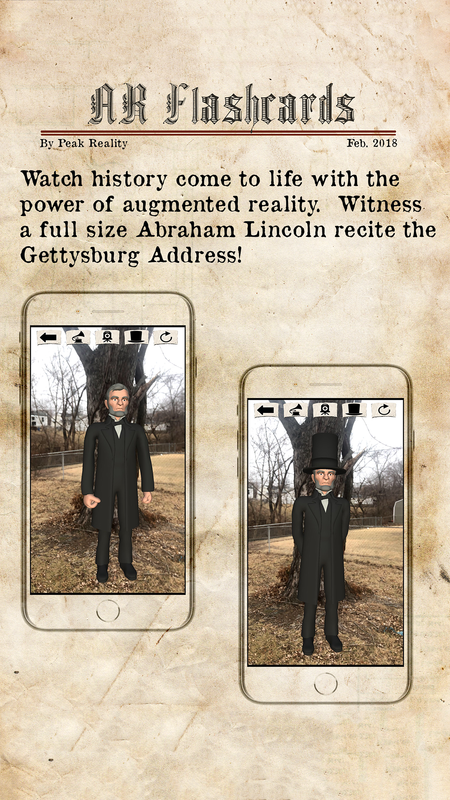 Saint Louis, Missouri – Mobile app developer, Peak Reality, LLC is pleased to announce that they have released AR Flashcards Abraham Lincoln to the Apple App Store. This is an augmented reality app using Apple’s ARkit to learn about Lincoln’s life. AR Flashcards Abraham Lincoln makes learning about America’s 16th President more immersive and fun than ever before. Using Apple’s ARkit, users can place a full sized Abraham Lincoln on the ground and watch him recite the Gettysburg Address. 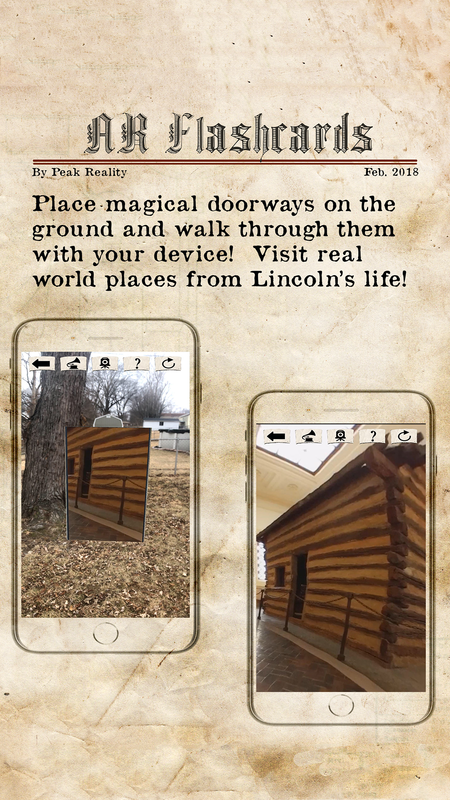 Users can also place doorways on the ground and step through them with their device to suddenly be transported to real historical places that Lincoln grew up in. Peak Reality recently updated all of their apps to be compatible with the recently released iOS 11 for Apple devices. 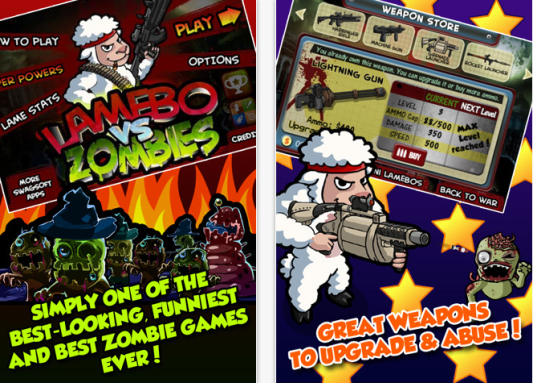 Interview opportunities, screen shots and digital downloads are available for working media. AR Flashcards Abraham Lincoln is Free (With In-App Purchases) and available worldwide exclusively through the App Store in the Education category. For more information, please contact Heath Mitchell. Based in St. Louis, Missouri, Peak Reality created AR Flashcards Animal Alphabet, their first mobile app in 2012. Using augmented reality and mobile technology, Peak Reality has reached over one million users providing children with a unique way to integrate technology into a learning environment. Recently, Peak Reality has been partnering with museums to create immersive interactive experiences. All Material and Software (C) Copyright 2018 Peak Reality, LLC. All Rights Reserved. Apple, the Apple logo, iPhone, iPod and iPad are registered trademarks of Apple Inc. in the U.S. and/or other countries. 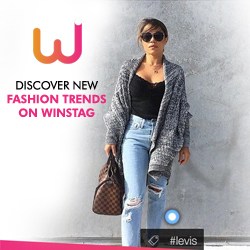 Other trademarks and registered trademarks may be the property of their respective owners.